On the clock face at the bottom it says New Haven Clock Co., USA. 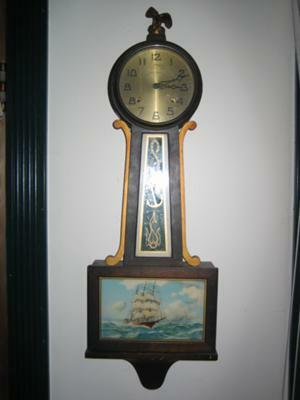 It measures High 27 1/2 inches, Width, 9 3/4 inches across the pendulum box. It has a reverse painting of a sailing ship on the bottom glass. It belongs to a friend that wants to sell it. She paid $200. to have it repaired, it is running fine now. I have read that the Banjo clock does not chime, and this one DOES.